The Monongahela Railway was built to haul coal. Heading south from West Brownsville, Penn., the railroad was a joint operation of the Pennsylvania Railroad, the Pittsburgh & Lake Erie (New York Central) and the Baltimore & Ohio. When the PRR and NYC merged, new railroad Penn Central controlled two-thirds of the operation. 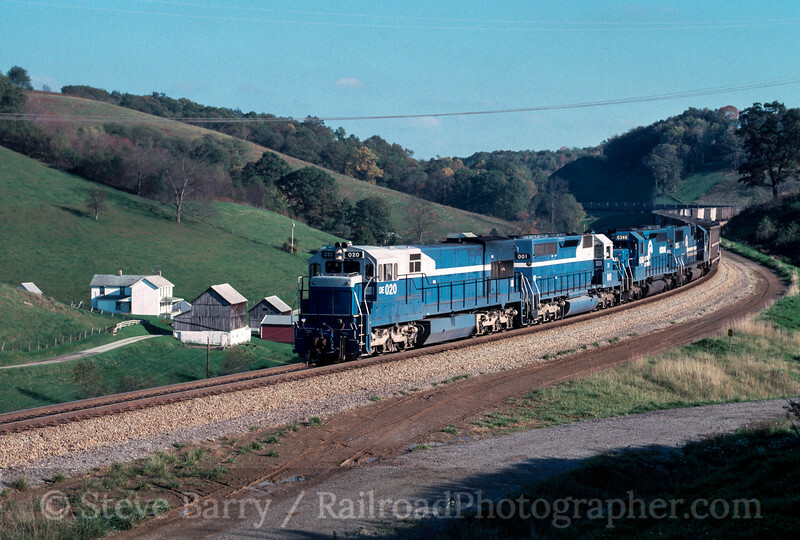 By the time of this visit in October 1990, the Penn Central share had gone to Conrail while the B&O's third was controlled by successor CSX. 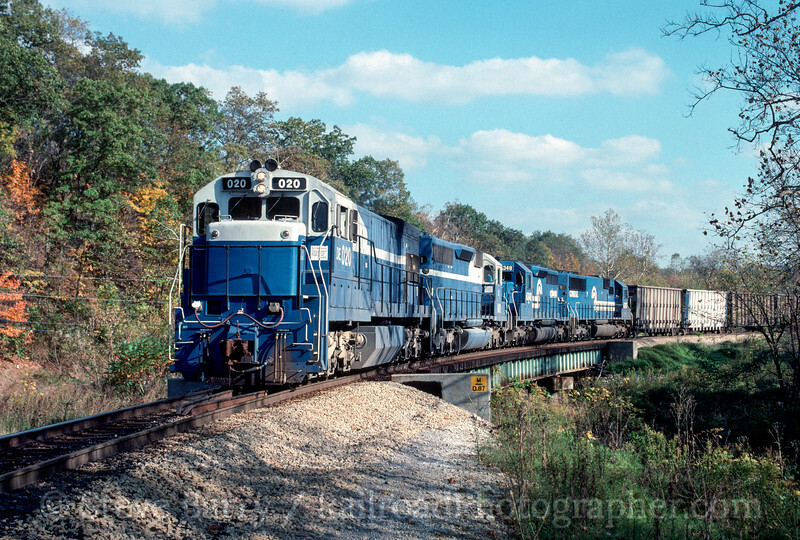 In 1993 the Monongahela vanished entirely into Conrail. 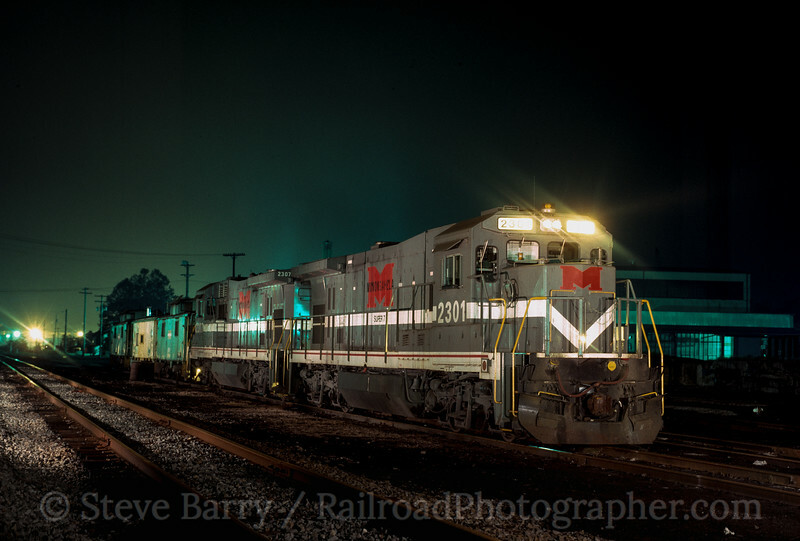 The railroad's headquarters was at West Brownsville, where we found a set of the railroad's "Super 7" locomotives, B23-7R's rebuilt by General Electric from units that worked for Western Pacific (above). The railroad actually consisted of two separate lines heading south from West Brownsville. 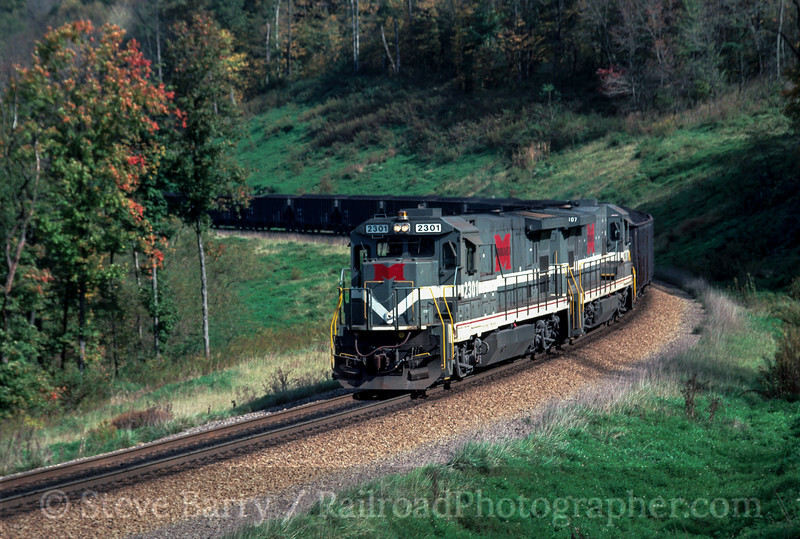 The railfan favorite was always the westernmost line, which was actually fairly new below Waynesburg, Penn. Officially the Waynesburg Southern (a subsidiary of the Monongahela's controlling railroads), the line opened into West Virginia in 1968. Prior to that, the railroad only went as far south as Waynesburg. 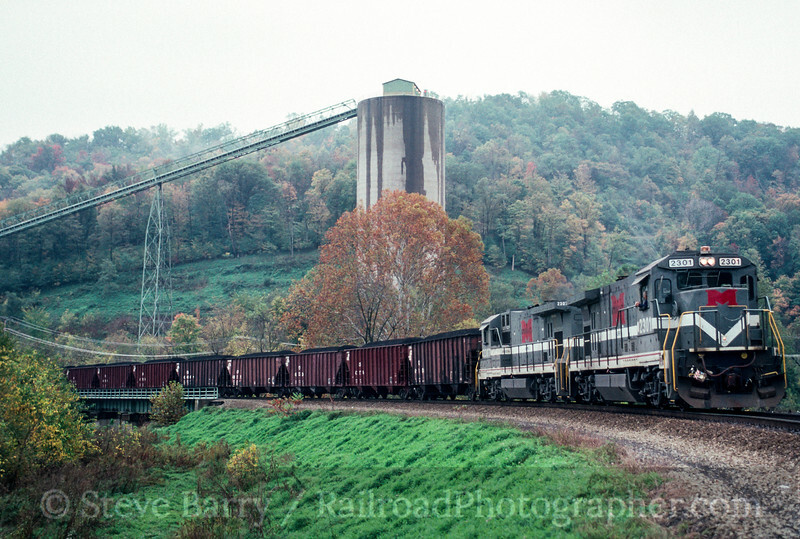 A train is seen passing the mine at Waynesburg as it heads onto the Manor Branch (below). If the Waynesburg Southern was the railfan favorite, the brand new Manor Branch was the favorite favorite. Due to its newness, it presented wide open vistas. The small town of Time became quite the place to shoot, as seen by this set of Super 7s pushing a northbound train through (actually above) the small town on a fill. I couldn't decide which shot I liked better, so here's the same train in the same location a couple of seconds later in the S-curve. If one got tired of Super 7s (like that was going to happen), the train to watch for was the unit coal train operated by Detroit Edison. 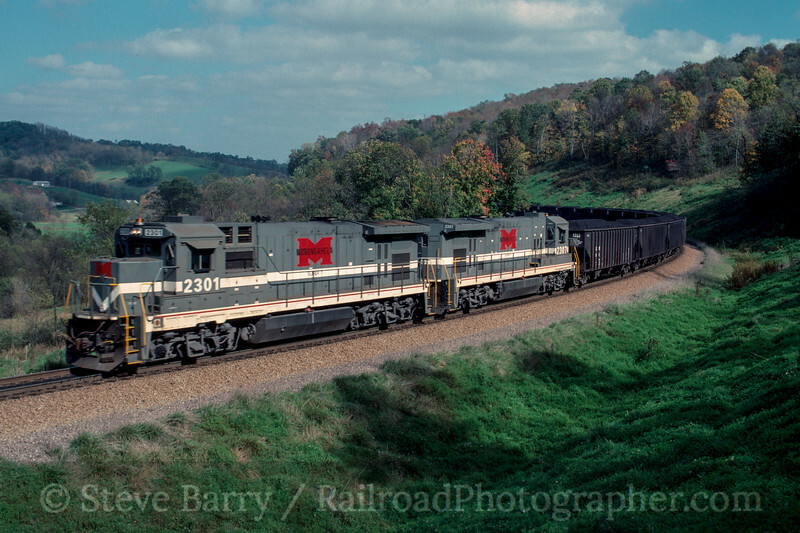 DE operated its own train from Michigan to the coal fields using the utility's own GE-built diesels. We see a set crossing a small bridge just south of Waynesburg before diverging onto the Manor Branch. And we chase the train out onto the Manor Branch to catch it at Time. Heading back to Waynesburg and continuing south on the Waynesburg Southern, we come to the town of Rogersville. 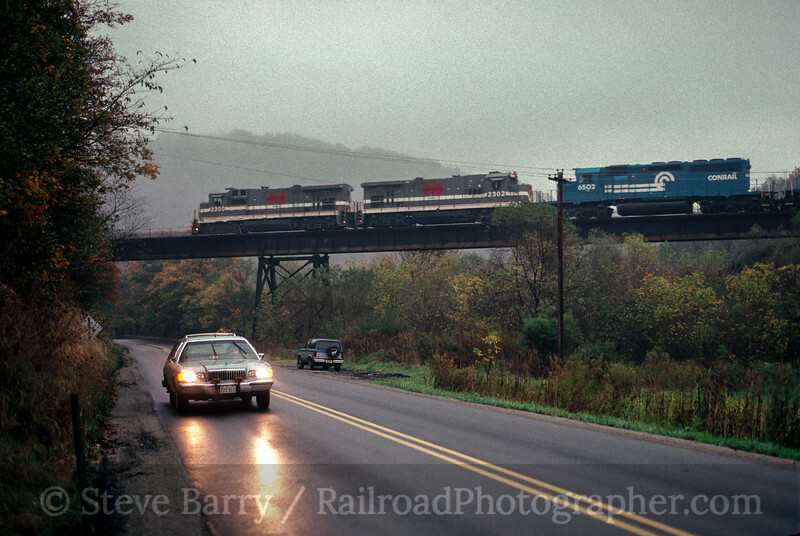 I'm sure I was mad at the time when the car showed up just as the train was heading over the bridge, but in retrospect the car's headlights accentuate the bad weather we were fighting on this day. And with that we'll wrap up this edition of Cool Chromes. Thanks for coming along! In your last photo, my Bronco II is parked for some reason.